People who know a bit about the history of U.S. presidential politics are familiar with some of the third-party candidates that have made bids for the office of President: Ross Perot, Ralph Nader, William Wirt. William Wirt? That's right. Wirt is actually the first name in a long line of third-party candidates for U.S. President. 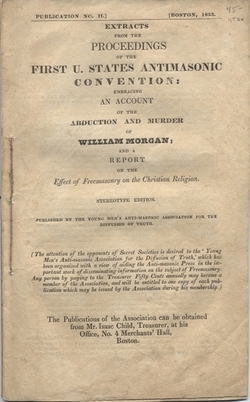 Now that the 2008 major-party conventions are behind us, it seems like a good time to take a brief look at the introduction of the first third-party candidate in a U.S. presidential election, as well as the first nominating convention for a political party in the U.S.
"Morgan's abduction and probable murder occurred at a crucial time in New York state politics. The Adams-Clay party was in a rapid state of decline, and [Dewitt] Clinton had affiliated with the Jacksonians, leaving many of his followers in a quandary, for most of them could hardly follow Clinton into a party controlled on the state level by Van Buren and the hated Regency. Conditions were ripe for creation of a new organization that would submerge factional differences and would unite voters behind a platform pledged to defend democracy and equality before the law. It was no accident that this party evolved in January 1827 from a series of local conventions that met while the first trial of Morgan's kidnappers was taking place." The first national nominating convention held by the Anti-Masonic Party - in fact, by any political party in the United States up until that point - was held on September 11, 1830. The date was a resonant one: it was the four-year anniversary of the abduction of William Morgan. Although much took place at the first convention, it was not until the second convention, in 1831, that a candidate was nominated for the party. That candidate was William Wirt, who had served as U.S. Attorney General from 1817 until 1829. Wirt was a reluctant candidate. When first offered the nomination he declined, but was eventually convinced to run for the party. Curiously, Wirt himself had been a Freemason thirty years before. Instead of harboring any grudges toward Freemasonry, Wirt appears to have been, instead, simply not very interested in it. In his letter accepting the nomination from the Anti-Masonic Party, he admits that he had been initiated in a lodge, but that he had never taken the Master Mason degree. In this same acceptance letter he wrote that his lack of interest in Freemasonry in not attaining the Master Mason degree "proceeded from no suspicion on my part that there was anything criminal in the institution, or anything that placed its members in the slightest degree in collision with their allegience to their country and its laws." Wirt even gave the Anti-Masonic Party a way out, stating that if, after reading his views they wanted give the nomination to someone else, then he would "retire from [the nomination] with far more pleasure than I should accept it." (You can read the entirety of Wirt's acceptance letter here.) Even after accepting the nomination, Wirt tried to get out of it. Between October 1831 and February 1832, he tried to withdraw from the nomination, but was unsuccessful. Despite all of this, in the general election held in the autumn of 1832, Wirt still managed to get seven electoral votes and carry Vermont, a state that, as we noted in earlier post, was a particular hotbed of anti-Masonry at the time. Vaughn, William Preston. The Antimasonic Party in the United States, 1826-1843. Louisville, KY: University Press of Kentucky, 1983. 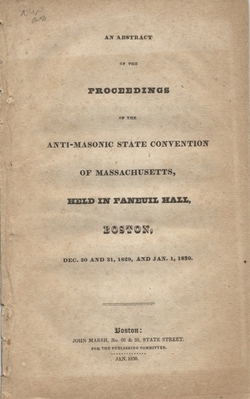 An Abstract of the Proceedings of the Antimasonic State Convention of Massachusetts, held in Faneuil Hall, Boston, Dec. 30 and 31, 1829, and Jan. 1, 1830. Boston : John Marsh, 1830. Proceedings and Address of the Pennsylvania Anti-Masonick State Convention, held at the Court House in Harrisburgh, June 25 and 26, 1829. New-Port, R.I. : Printed by Allen and Folsom, 1829. Proceedings of the Antimasonic Convention for the State of New York : Held at Utica, August 11, 1830 : with the Address and Resolutions. Utica, N.Y. : William Williams, 1830.